By Hongkiat Lim in Desktop. Updated on November 30, 2018 . When we talk about reading on-the-go, I personally think that e-books readers are the best medium to do so. Although there are audiobook apps that you can carry in your smartphone, but those heavy audio files burden your phone and quickly eat up the battery (something you’d never want while traveling). On the other hand, e-book readers are easier to carry and convenient to read from. So, if you’re up for getting yourself a nice e-book reader, take a look at this post that lists some of the best options in the market. I have highlighted each device’s features and negative aspects so you have an easy time making your pick. Let’s read along. 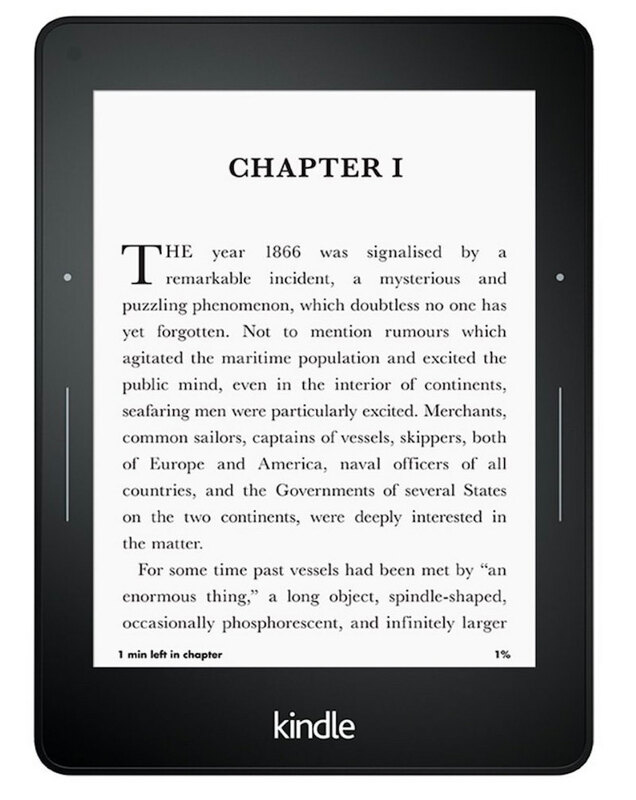 Kindle Paperwhite is one of the most popular choices among e-book readers. 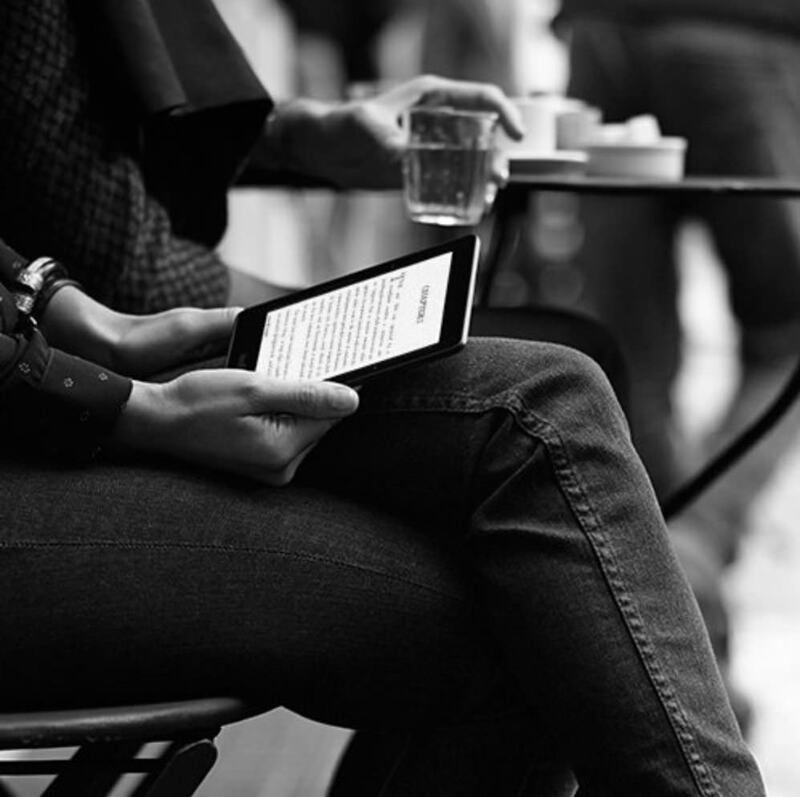 Thanks to e-Ink technology, you get an impressive reading experience through the screen that mimics ordinary book pages. Moreover, as it is supported by a database of millions of e-books on Amazon, you can simply buy any book and have in on your device in seconds. 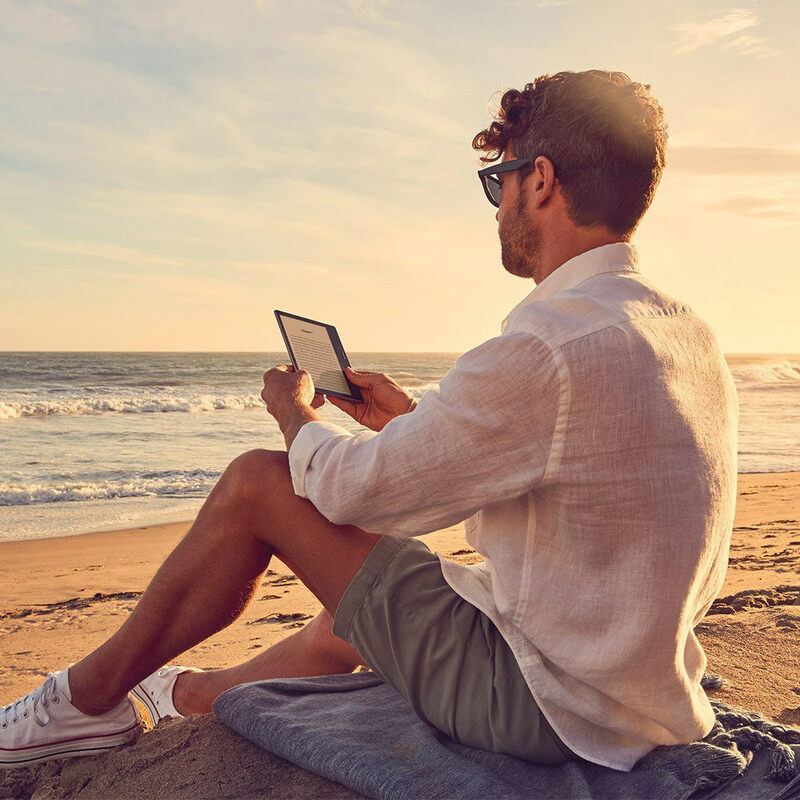 The Kindle Paperwhite E-reader has a glare-free screen that allows you to comfortably read even in direct sunlight making it a perfect reading device on a sunny day at the beach. Similarly, in a dark environment, its screen light is bright enough to read but won’t strain your eyes. Also, like other e-book readers, it offers you to read e-books and articles in landscape mode as well. It supports a lot of different formats, including PDF, Mobi, and RTF. However, unfortunately, it does not support ePub – one of the most popular e-book formats. In case you want to read ePub e-books on this device, you’ll have to convert the file into a Kindle Paperwhite-compatible format. What I didn’t like about Kindle Papaerwhite is that there’s no power adapter included in the box which means that you’ll have to rely on some other cable which may or may not work. Moreover, this e-book reader is not waterproof and also takes a long time to charge. But once fully charged, it goes on for about a month with normal use. Another e-book reader by Amazon, Kindle Oasis has a much larger display than its predecessors which is a noticeable difference. Though it is a bit expensive, however, it offers some of the most advanced features that justify its high price. Kindle Oasis has a modern ergonomic design that makes it easy to hold and is quite lightweight (only 4.6 ounces). 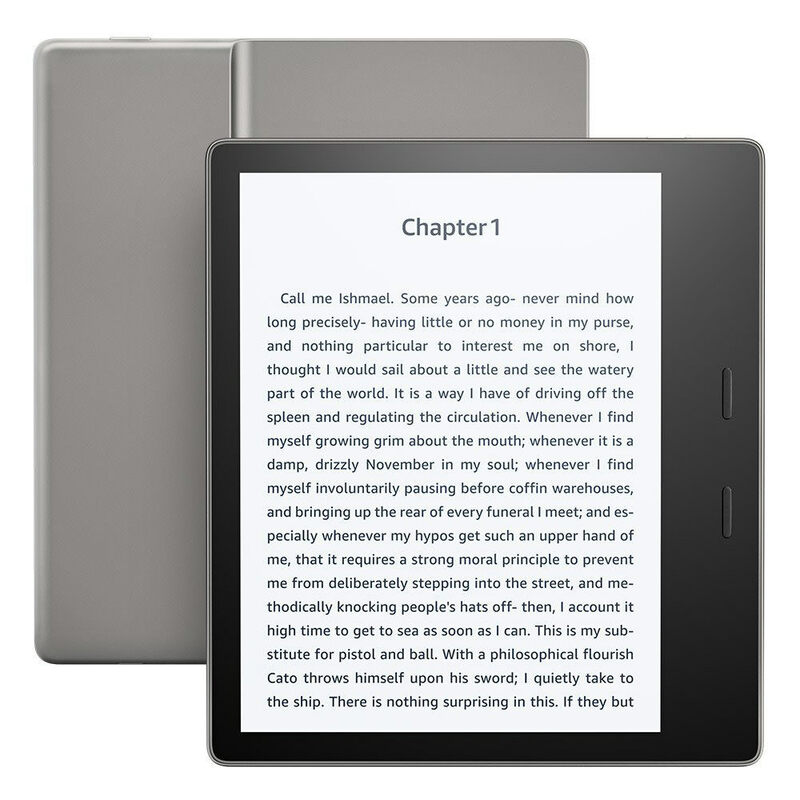 For those who still feel nostalgic about the buttons on the first generation of Kindles, in this model you’re going to find buttons to turn pages. What is special about this particular device is that you can not only read e-books on it but also listen to hundreds of celebrities-narrated audiobooks while driving, cooking, or traveling. It has a glare-free high-resolution display that makes you feel like reading a physical book. With a huge storage capacity of 8GB, you can upload hundreds of e-books, magazine, newspapers, and audiobooks. It is also waterproof so you can take it to even more places to read. Talking about cons, its biggest disadvantage is the high price which makes it the most expensive of all Kindles. Additionally, it takes ridiculously long time (about 21 hours) to charge, but once charged, the battery lasts for weeks. If you are going on vacation to the seaside, you’ll be going to need a device which can withstand the waves. 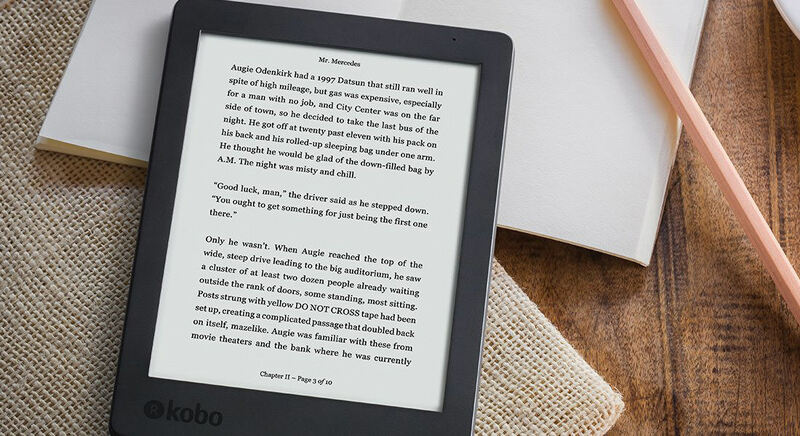 Kobo Aura H20 prides itself on being the best waterproof e-book reader as it can stand up to 1 meter of water for half an hour. 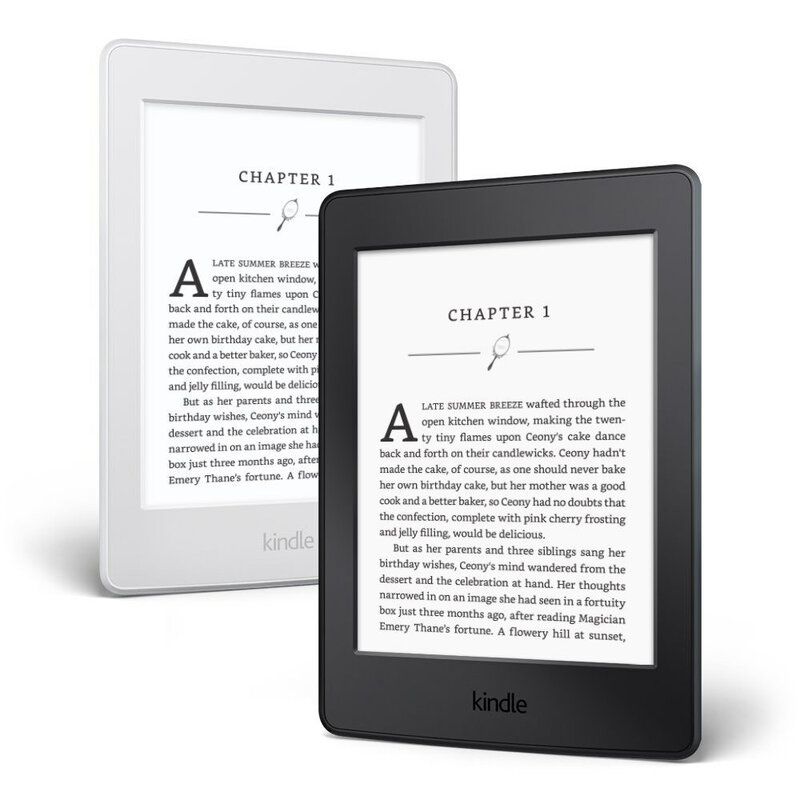 It features 6.8 inches glare-free screen with a high-resolution display, seamless page turns, and Carta e-Ink which is also used in Kindle Paperwhite. The device has automatic blue light adjustment feature for bright and dark environments as well as adjustment settings for the font size and margins – all of which gives you a great reading experience. 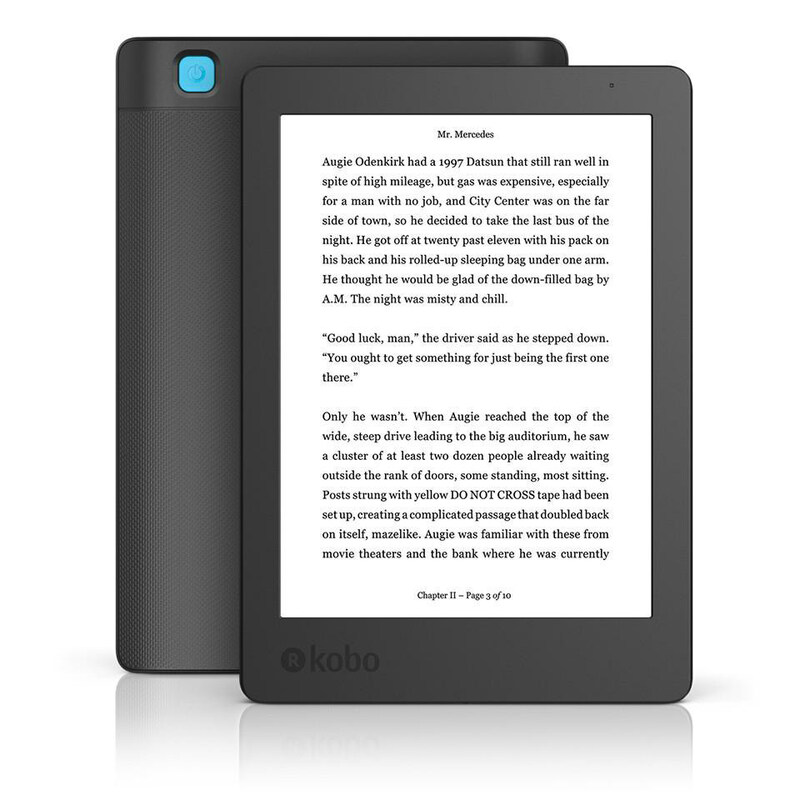 Kobo Aura H2O is supported by Kobo store from where you can download any e-book you want from over 5 million titles. It also comes with a built-in dictionary, page highlight and notes-taking feature, along with a hefty storage of 8GB. The downside of this device is that you cannot borrow e-books from a public library right on the device as it does not have Overdrive built into it. Also, it is larger and more expensive as compared to Kindle Paperwhite. But if you’re looking primarily for a weather-resistant device with great UI, this is the one for you. A third entry in this list by Amazon, Kindle Voyage is a slightly upgraded version of Kindle Paperwhite. It offers an excellent reading experience thanks to a sharper display, pixel-dense screen and the backlight feature that automatically adjusts to select the right level for the ambient light. 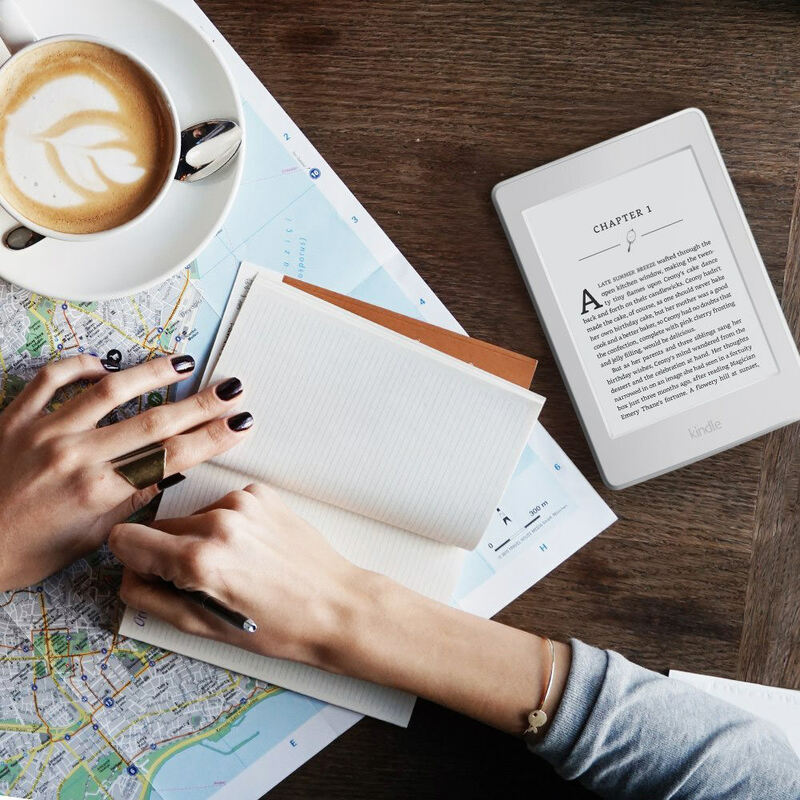 When it comes to the physical features, Kindle Voyage offers a premium rubberized design in comparison with the plastic design of Kindle Paperwhite. It is thin, light and comes with impressive PagePress buttons on the left to seamlessly flick pages. Also, it has an automatically rotating screen allowing you to use buttons if you are a left-hand person. The battery life of Kindle Voyage is impressive; you can use the e-reader for weeks without the need to recharge. Moreover, the e-book reader allows you to export notes and quotes to your email with ease and you can even set daily reading goals if you want. A high price is one of its biggest negatives that makes it less affordable for an average reader. Also, like other Kindle devices, it does not support ePub e-book format and is strongly embedded into Amazon ecosystem. If you can live with that, then it is surely a great e-reader to have. 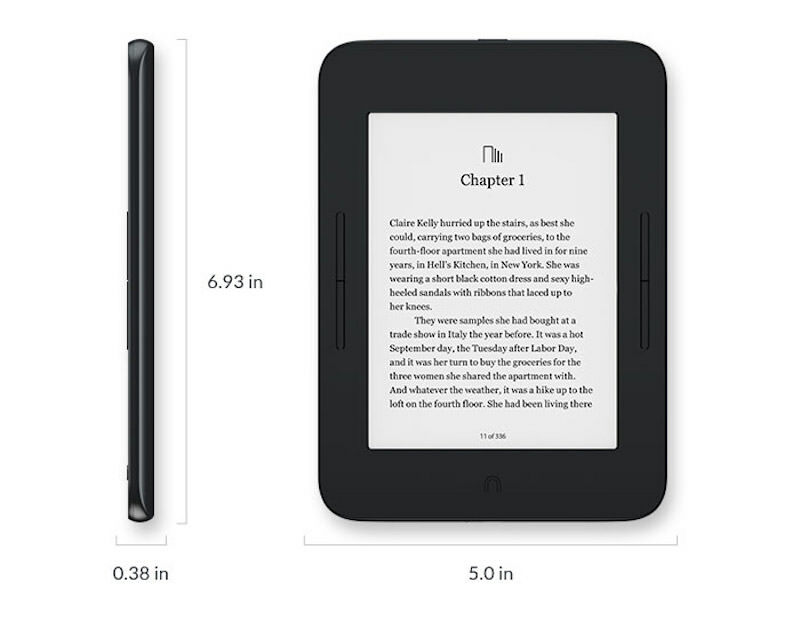 One more e-reader which goes at the same price range as Kindle Paperwhite is Barnes & Noble. This is an Android-based device with a glare-free, fingerprint free, and dustproof screen. It has a 6-inch display with a soft glow that you can manually adjust to fit surrounding environment. Thanks to Android you can install third-party apps for the e-reader using USB cord. 4GB of memory is more than enough for thousands of books. You can create an account on Barnes & Noble store to access a great collection of curated titles. When it comes to disadvantages, one can say that it does not have a great grip, mainly because of the aluminum back that makes it easier to slip and drop the device. 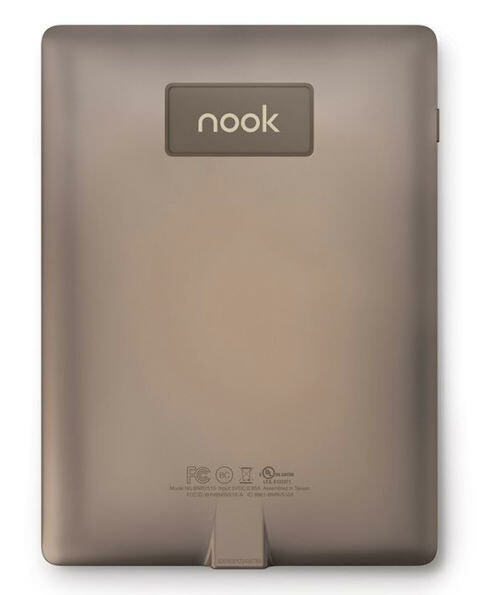 But if you are looking for a truly waterproof e-book reader with some cool features, this device can be your pick.